Last Friday I received some unfortunate news from the Moto Guild SF email blast. Aleks and Wilder, the shop’s current owners, have decided to move on and sell the business – or close if a new owner can’t be found. I consider myself a relatively new rider with a mere 4 years of experience, and over the short time I’ve been going there, the shop has been an incredible resource. Losing it would be a huge blow to the Bay Area motorcycling community. For those unfamiliar with the business, Moto Guild (formerly Moto Shop) is essentially a makerspace for motorcycles. For a reasonable hourly rate, you can rent a workstation complete with a toolbox and service lift to perform any maintenance you want. They also stock parts, conduct a variety of hands-on classes, and provide one-on-one instruction for more advanced topics like suspension rebuilds. The San Francisco location currently operates out of a spacious warehouse on Treasure Island, and was one of four independently owned and operated locations along with Silicon Valley, Chicago and Philly. Moto Guild is where I really got to know each of my motorcycles. I’ve been taking my first bike – a 1992 Honda CB750 Nighthawk – to Moto Guild since moving to Oakland two years back. Before that, I was operating out of a carport behind my apartment in Palo Alto and I was hesitant to tackle anything more complex than an oil change. I watched at least a dozen YouTube how-to videos before that first oil change, and even then part of me was worried the thing would blow up when I tried to start it for the first time. On a less humorous note, I would tend to let fundamental things like adjusting the drive chain tension slide for longer than I should, just to avoid having to bring the bike to the shop or buy the tools to do it. My Nighthawk during its first visit to Moto Guild – still had the pre-grad-school NJ plate then! My first experience at Moto Guild was the Minor Service Workshop and it was a watershed moment for me as a motorcyclist. The class consisted of myself and two other riders and was instructed by a real mechanic. The first task was an oil and filter change – something I thought I had down pretty well. As I was waiting for my engine to drain, the instructor indicated a rubber tube protruding from the bottom of my motorcycle. I had noticed it before, but didn’t pay any attention to it in the 10k or so miles I had owned the bike. I’m sure you can see where this is going. I pulled the plug from the tube, which I found out was called “the crankcase breather,” and an unsettling volume of gross milky liquid poured out. Thankfully the instructor was quick to provide an explanation. It was just oil mixed with condensed water that was expelled from the crankcase and it’s not uncommon on older bikes like my Nighthawk. 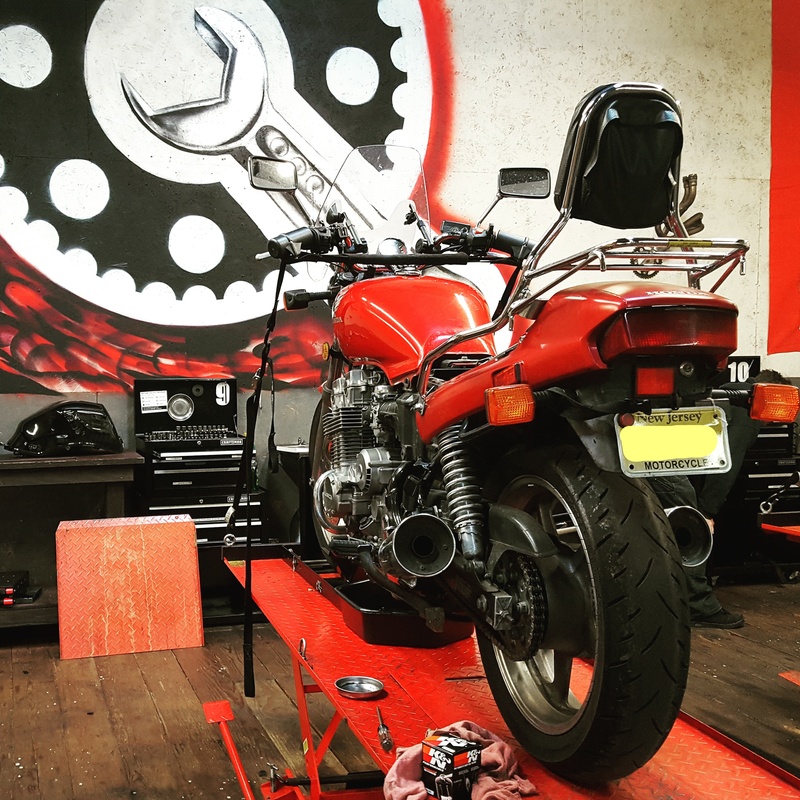 In addition, the class covered fuel tank removal (to get at the spark plugs), a spark plug change, air filter change, brake fluid check, chain adjustment, cleaning and lubrication, clutch lever adjustment and throttle free play adjustment. While my classmates with newer bikes were removing fairings and topping off their coolant, the instructor showed me how to lubricate my control cables, which had never been done before on my bike judging by how much crud got flushed out. At the end of the class, I topped off the air in my tires and fired up the bike. I was astonished at the difference, it was like riding a different bike! The class was a great experience, and it’s what got me into performing my own maintenance and enjoying doing it.